Writing a book is an art. However, this normally does not refer to nonfiction books, especially scientific ones. Douglas R. Hofstadter’s literary marvel is the exception. It is a philosophy book that reads like music, a work of art that many consider second to none. 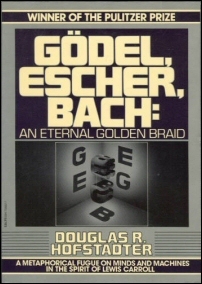 Gödel, Escher, Bach (GEB) debates the question of consciousness and the possibility of artificial intelligence. It is a book that attempts to discover what “self” really means. Introducing the reader to cognitive science, Gödel, Escher, Bach draws heavily from art to illustrate fine points in mathematics. The works of M.C. Escher and J.S. Bach are discussed, in addition to other works of art and music. The topics presented range from mathematics and meta-mathematics to programming, recursion (in math as well as in computing), formal systems, multilevel systems, self reference, self representation, and others. Before each of GEB’s twenty chapters, Hofstadter includes a dialogue, in which Achilles, the Tortoise, and their company discuss various aspects that will later be examined by the author in the chapter to follow. In writing those dialogues, Hofstadter created a whole new form of art. Concepts are presented by the dialogues on two different levels, simultaneously: form and content. The more obvious level, that of content, presents each idea directly, by providing the views of the merry band -- sometimes right, often wrong, and always funny. The true joy, however, lies in discovering the way in which Hofstadter interweaves the very same ideas into the physical form of the dialogue. The form deals with the same mathematical concepts discussed by the characters, and reminds the reader of the musical pieces by Bach and printed works by Escher that the characters mention directly in their talks. A simple example is the dialogue preceding Chapter III. Called “Sonata for Unaccompanied Achilles”, this dialogue directly quotes only one character, Achilles, while he converses over the phone with his friend the Tortoise. They talk about the mathematical notion of figure and ground: how, by defining one subset of a given set, you implicitly define another subset of that same set -- the part that is not included in the first subset. 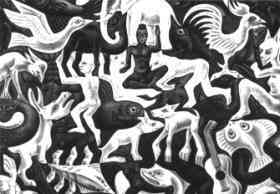 In the visual arts, this is best exemplified by Escher’s Mosaic lithographs, where the shapes that form the background for a group of black “phantasmagorical beasts” define another set of figures, in white. The musical example that Hofstadter uses is Bach’s Sonatas for Unaccompanied Violin, where the listeners' imagination fill in “between the notes” as the violin plays, and one often imagines hearing the accompanying piano. But the form of the dialogue pulls the very same trick, as the reader can easily imagine the Tortoise answering Achilles at the other end of the line! Another example is the “Crab Canon”, preceding Chapter VIII. This short but highly amusing piece can be read, much like the notes of Bach’s Crab Canon, in either direction -- from start to finish or from finish to start, resulting in the very same text. Fiendishly complex to write (or translate), the artistic beauty of that dialogue at least equals that of Bach’s piece or Escher’s drawing of the same name. But this is only the tip of the iceberg. Other issues discussed in GEB include, for example, self-reference and self-representation, both of which Hofstadter considers to be crucial parts of any attempt to understand what intelligence really is. Self-reference (self-ref for short) is the notion of an object, physical or conceptual, that references its own self in some manner. A person talking about himself, or even just pointing at himself, is self-referencing. Another simple instance of self-reference is the one-line paradox: “This Sentence is False”. It is easy to see that texts that reference themselves, even if they are as short as the example cited above, can lead to amusing or paradoxical results. Self-representation (self-rep), on the other hand, is the more complex notion of an object that includes, within itself, a complete representation of itself. This is more complicated to achieve, but one easy to grasp example would be a mirror facing another mirror. Each of these mirrors contains a complete representation of itself (in fact, it contains an infinite number of such complete self-representations, each smaller than the other). By playing around in an amusing manner with these, and many other, mathematical concepts, Hofstadter slowly and gently introduces the reader to more advanced mathematical ideas, like formal systems, the Church-Turing Thesis, Turing’s Halting Problem and (eventually) Gödel’s Incompleteness Theorem. GEB discusses some very serious matters, and it is not an easy book to tackle. However, it is very enjoyable to read, as Hofstadter augments each subject with examples from very diverse sources. The joy of discovering the puns and other playful gems hidden in the book is part of what makes it so special. Anecdotes, word plays and Zen koans are additional aspects that help make GEB’s 777 pages an experience that many readers consider to be a turning point in their lives. Like every other book published by Hofstadter, GEB has an index and a bibliography that must be noted as exceptionally well done. It is interesting to note that while GEB is full of English wordplay, it is in no way tied to the American origin of its author. For years, the book was considered “impossible to translate”, but the first translation (to French, done by Robert French and Jacqueline Henry with the help of Hofstadter himself and published in 1985) opened the gate to a flood of additional translations. So far, GEB was translated into French, German, Spanish, Chinese, Swedish, Dutch, Italian and Russian. In his latest book, Le Ton beau de Marot: In Praise of the Music of Language (reviewed here), Hofstadter discusses translations of GEB and the art of translation in general. It is not, however, merely a book about translation, as it might appear at first glance. Some of the humor in GEB is really well-hidden. Check out the Book In-Jokes page for details about some of it, as well as many humoristic gems from other books. Hofstadter’s latest book, Le Ton beau de Marot (reviewed here), is in many ways a work of art, similar to GEB. It also deals with the subject of “self”, though it approaches it from a different angle. Metamagical Themas: Questing for the Essence of Mind and Pattern is a collection of Hofstadter’s monthly “Metamagical Themas” column in Scientific American during the early '80s. Co-edited with Daniel C. Dennett, The Mind’s I: Fantasies and Reflections on Self and Soul is a collection of essays by noted writers about self and soul. Fluid Concepts and Creative Analogies: Computer Models of the Fundamental Mechanisms of Thought, written with the Fluid Analogies Research Group, includes a serious discussion of Hofstadter’s research work. You may want to note ג× that in addition to references to music, more specifically to the structure of various musical forms (notably canons and fugues), the book as a whole is structured as a musical piece, a fact that may not be apparent from the onset. But if you read very attentively, by the time you reach the last page, some inexorable force compels you to turn to the first page - there to see, that which you may have missed in the beginning, but now makes the masterpiece complete ג with the same feeling of resolution and satisfaction you are bound to feel at the coda of a masterful rendition of a great musical piece. Yes indeed, this masterpiece easily can become a turning point in ones' life. This book is so unique, that when people ask me in what way is this book similar or reminiscent of some other book? I am compelled to say: It is has words, numbers and figures, printed on paper, all set in a binding ג and there the similarity ends. Due to repeated spam attacks on this specific page, commenting is currently disabled.